Gordon Ball and Lamar Alexander are seen in this composite photo. NASHVILLE - Democratic U.S. Senate candidate Gordon Ball said Thursday the federal government has no business regulating pot. "I believe the federal government should repeal any prohibition concerning marijuana," the Knoxville attorney said during a Nashville debate with six third party and independent candidates. It appears to be the first time a nominee for statewide office in Tennessee from either the Democratic or Republican Party has said that. Equally unusual was that all six of the other candidates -- who ran the ideological gamut from hard left to hard right -- pretty much said the same thing. 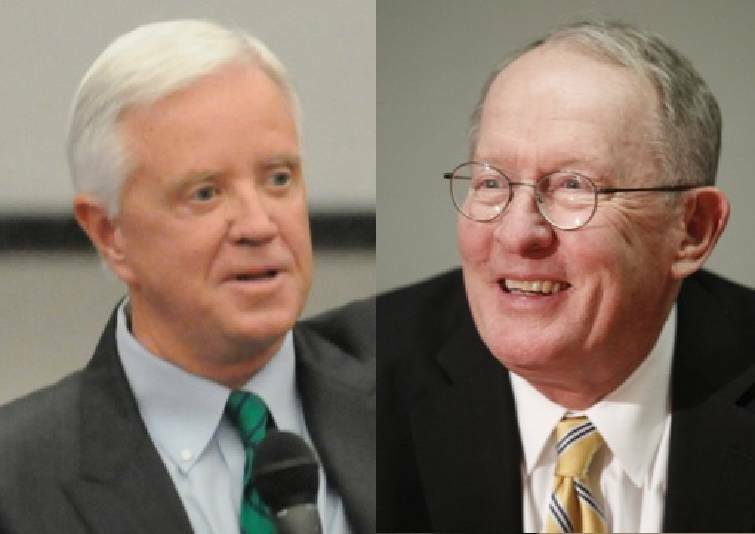 Republican U.S. Sen. Lamar Alexander, R-Tenn., did not participate in the debate, citing previous commitments. Ball cited the experience 25 years ago of a woman who was friends with his wife. "She had a 2-year-old," he said. "She couldn't take any drug at all to relieve her pain except marijuana. It was illegal at the time. I believe in medical marijuana and it helped her to get over the pain." He said the woman survived. Danny Page, a religious conservative, fielded the question first. He declared the "federal government does not have the enumerated power in the United States Constitution to restrict the growth and sale of marijuana." It is up to states, Page said, noting, "now as a Christian, that's not something I'm going to partake of." However, Page noted he has a teenage son who has epilepsy and takes hemp oil to relieve seizure. Growing, possessing and selling marijuana is currently a federal crime. Green Party nominee Martin Pleasant and Libertarian Party candidate Joshua James agreed the federal government should leave it up to states to decide how to handle marijuana. So did Constitution Party nominee Joe Wilmouth and self-styled "Anti-Party" candidate Ed Gauthier and independent Tom Emerson. Gauthier noted it's been a major state revenue booster for Colorado, which has legalized recreational use. Several other states have legalized medical marijuana. Pleasant said if states legalize marijuana use they should consider enacting some types of protections on edible items to ensure children and pets don't consume them. Libertarian candidate James said the issue "comes down to choice," but he cautioned, "know the outcome of your choice."